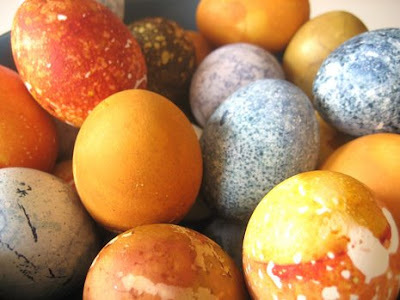 Learn how to dye Easter eggs using cabbage, beets, spinach, and all kinds of other things kids hate to eat. Project instructions and lovely photo by Chris at Curbly. my grandmother used to dye eggs every year with onion skins. they come out a beautiful red-brown. The produce people just let her take all the loose skins in the bin. If I dye my eggs and they come out like that, they're staying out all year long. That is GORGEOUS! Now I have a weekend project. Don't tell my friends I'm blowing them off to dye eggs! For some reason, I love these subtle colors much more. What a great idea. I haven't dyed eggs in years. I kind of want to this year just to try this out. Hmmm. But then who would eat all those boiled eggs??? I love these! Years ago (like 20) my grandmother and I dyed eggs using beets & tea. I collected little flowers and plants from the backyard which we pressed against the eggs and then covered them in pantyhose before dipping them. They came out beautiful. So pretty! I'm going to have to try this with the kids (my son's absolute favorite color EVER is orange). You post the best little finds from the net. It's always a pleasure to visit your blog. I love these eggs! Anything done more "naturally" is just down my alley. Thanks for posting this. I love this idea. So simple yet stunning. I think I will try this with my daughter. Thanks for the info. Love your blog! So much inspiration... not only in this post, but all of the comments as well! Fun! I think I remember doing this with onion skins as a kid. I did this before using red onions - also drew design then scraped off the design - left the white coloring of the egg. This looked beautiful!